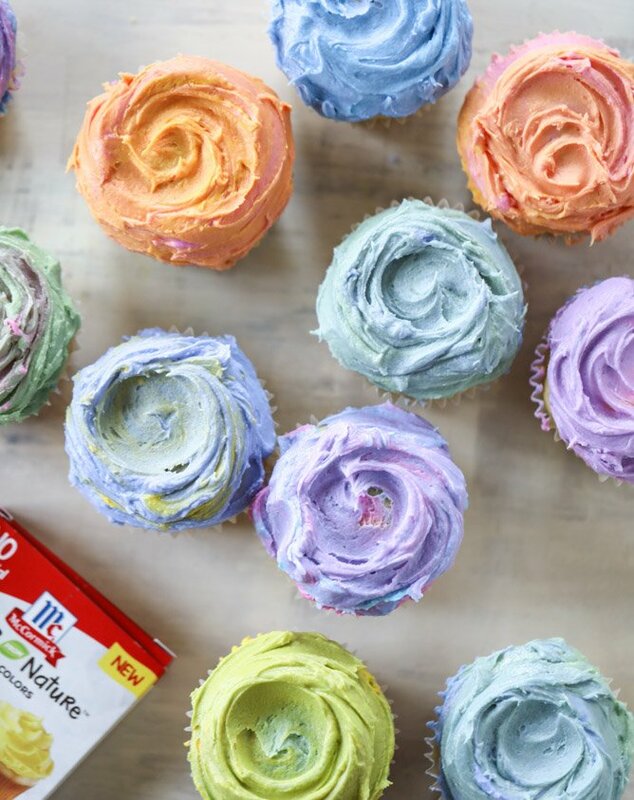 Let’s bring out our inner 13-year old with most fun, colorful frosted cupcakes! I don’t know how I’ve gone on so long without swirling my frosting into pretty colored rainbows. 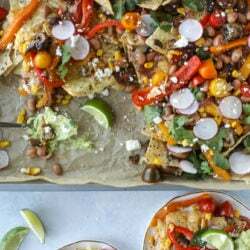 Get ready to add this to your menu in the next few weeks. Have you seen that mermaid toast all over instagram? I’ve been dying to make it and took a quick stab at cupcakes first. This Easter, I’ve teamed up with McCormick to help create easy and colorful essentials to brighten up your brunch table. I was so torn between the sweet and the savory… and eventually settled on olive oil cupcakes with mascarpone buttercream. Wouldn’t that be the perfect companion to your Easter brunch?! They are super simple to whip up (no mixer needed! ), aren’t quite as sweet as regular cupcakes AND have this to-die-for frosting on top. I live for everything mascarpone. You know this. The cake itself might be my new favorite cake! They are fluffy inside and more mild than a super sweet vanilla cake, which is set off perfectly by the buttercream. More often than not, I eat the cake and discard the frosting because bites of it together are just TOO rich. Even though my teeth are insanely sweet, bites of frosting only? No can do. But not with these babies! They let the mascarpone frosting shine. And I had to make the buttercream all gorgeous and unicorn-like. Aren’t those rainbow swirls just the cutest? For the colors, I used the McCormick Color by Nature Food Colors. I was SO excited to find these. Obviously, I love neon and bright colors and especially, obnoxious tie dye and what not, but ever since Max was born I have stopped using regular food dyes as often as I did before. I think the only time I’ve brought them out in the last two years is when I make Mother Lovett’s coconut thumbprints at Christmas. But! The base for the natural colors are beet juice, spirulina and turmeric, and I love that they are a powder that you can easily mix into frosting. Plus, on the back of the box, they give you the measurements to make a few different colors, like lavender and mint green. Hello color lovers. While the colors themselves are so super cute, I really wanted to do some sort of rainbow swirl. I wanted the tops to look like my attempts at tie dyeing my white t-shirts back in the 90s. And I’m sure you can guess my favorite ones. The coral one and the purplish-pink? They remind me of the perfect unicorn. And if you guys need some other brunch ideas, I’ll be sharing a TON in the next few weeks. I went a little brunch overboard. I’m also going a wee bit crazy over these Carrot Cake Waffles, Overnight Lemon Blueberry Muffin Casserole or these Baked Eggs and Sweet Potato Hash on a sheet pan. In a bowl, whisk together the flour, baking soda, powder and salt. In a separate bowl, whisk together the water, olive oil, sugar, lemon juice and vanilla extract until combined. Add the wet ingredients to the dry, stirring until combined. Fill the liners 3/4 of the way full with batter. Bake the cupcakes for 16 to 18 minutes, until they are just golden on top. Let cool completely before frosting. Place the butter and mascarpone in the bowl of your electric mixer. Beat until creamy, then gradually add the powdered sugar a few spoonfuls at a time. Add the vanilla extract, scraping down the sides as needed. Beat the frosting on medium-high speed for 4 to 5 minutes until it’s fluffy. Scoop the frosting into jars or bowls, depending on how many colors you want to make. Use the guide on the back of the box to determine the intensity of your shades. Mix the food colors into the frosting well until combined. If you’d like to do the rainbow swirl frosting, add a few colors on top of the cupcake and gently swirl with your knife, just a few times. Serve the cupcakes once frosted! My Lisa Frank loving heart just stopped. THEY’RE LIKE EASTER EGGS IN CUPCAKE FORM :D :D :D! I love the tie dye effect, but I hate trying to spell tie dye. These are so pretty. I have had olive oil cake at a Greek festival in my town. I am going to have to try these cupcakes. Maybe I will take them into my office; my crew will love them! I love the way you frosted the cupcakes! The look so pretty, very Magnolia-esque. Obsessed with the idea of natural food colouring. 100% going to buy those! So fun! I’ve been wanting to try the Color By Nature food coloring. I’m with you about buttercream and sweetness. It’s usually just too much sweet. I will have to try this one. The world needs more rainbow colors! Nicely done! Saw these and immediately thought Easter — love them! This video is awesome! I love these sweet and delish cupcakes! Wellllll I’m obsessed with mascarpone and rainbow mascarpone? DONE AND DONE. hey girl- love the cupcakes! So cool! Do these really have NO EGGS?!!! I am so excited since I can’t eat eggs. These look amazing! I love the rainbow of colors in each swirl! Love this!! Colour colour colour!!! Would love to see you try your hand and layered cakes with different colours!! Great post!! They are absolutely gorgeous. Why had I never thought of putting a couple of colours on a cake and swirling! I have a couple of little peoples birthdays coming up would love these! These are totally amazing!!!!! best post ever! those colors…. Nice, love mascarpone, seems like it’s not used often except as an afterthought, at least by me, so thank you for this recipe, love the colors too! Really recipe cake. You have really done a nice job. As you have shared the best things for me. Even this recipes can be made in busy time also. It’s really special for me. thanks for sharing it here on this site.